bebop spoken here: Belated news on the passing of Joe McMullen. 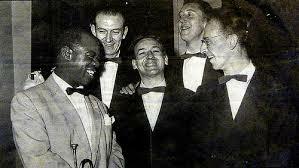 Alan Rudd has sent me the sad news that trumpet player Joe McMullen (right facing Louis) passed away a few months back. Alan tells me that it was probably not widely advertised, as the family just wanted a private funeral. Joe would be in his late 80's and was a prominent figure on the local jazz scene from the early 50's until his health declined in later years. He played with the Panama Jazzmen in the 50’s & 60's, highlights included a memorable Newcastle City Hall concert when they were the support band for the visit of Louis Armstrong and his all Stars. Later Joe was a key member of the popular Savannah Syncopators, writing many of their arrangements as well as playing trumpet. 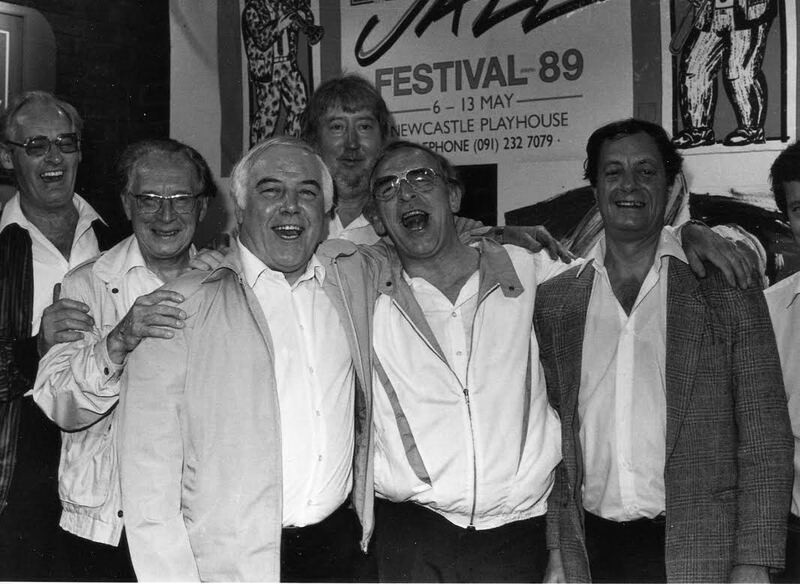 More recently he led the Jazz Esquires, playing at the Porthole in North Shields, for many years until he retired. Joe was a great character on the local scene, very enthusiastic and professional about everything he was involved in, always full of energy, and possessing a great sense of humour! (In the above photo of a 1989 Panama reunion Joe is second from the right of the picture). Sad news, a fantastic and witty guy and wonderful player. It was such a pleasure to gig many times with you, mainly at the Porthole, goodbye Joe. Great article. He was a funny man, always cracking jokes, all the way to the end. Though , it's spelled "McMullon" with an O.